I had long pondered a trip to South Wales; there is something mysteriously attractive about roller coasters in a woodland setting, and with a driving license at my disposal it seemed like a waste not to put it to use, but I had always put the trip off because of work and/or sheer laziness. But with whole weeks of complete summer freedom I realised my duty as an enthusiast would have to surface. So it was up at an unholy hour in order to begin the 5 hour journey from London to Narberth. 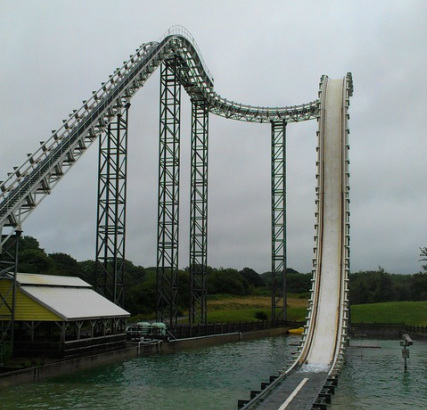 Weather forecasts were grim but I had a steely determination not to be put off, and so after a surprisingly smooth drive we had arrived at Wales’ best theme park (so the signs told us, we weren’t too surprised) in a steady drizzle. I expected to see the ride roster sprawled across a field, but just from pictures you get no sense of how extreme the topography is, and it makes the park feel much more isolated, and certainly in a good way. The park is also a lot smaller than I imagined, but this is also no bad thing as it wasn’t at all busy; it just means it’s quicker to get from ride to ride. We headed straight to the back of the park and to Megafobia, which is completely invisible as you approach from the right until you are directly in front of it. The queue winds through the ride’s structure, and has an incredible view of the first drop across the lake. With Tonnerre de Zeus fresh in my mind I opted for the back row. I was not disappointed. The drop, despite being only about 80ft, is phenomenal and at the very bottom of it there’s a patch of bone shaking roughness, but it’s short enough that it only adds character. A lateral filled turnaround follows a double up before the best part of the ride; the ejector airtime filled onride-camera drop. Unlike Zeus, which gives frequent pops of air before catching you at the bottom of the hills, Megafobia is far more forceful; after the crest it slams you down into your seat in the trough; it’s amazing. A couple more floating hills go past before another ejector drop. There are then a few forceful, near rough, turns and dives before crashing into the brakes. Enthusiasts regularly squabble over which attraction, Nemesis or Megafobia, is the best in the UK, and I would give the crown to Megafobia (but I would still rank it below Tonnerre de Zeus). It’s a very decent length, it provides a good amount of airtime, including three doses of powerful ejector, and is just violent enough to keep it forceful without being painful. The weather Gods were also favouring us as the rain was clearly making it run a good deal faster than usual. So good was it, and so empty the park, that we sat in our seats for another two circuits. As always, I only mention food in a park if it isn’t average, and unfortunately our meal from Dixie Chicken Diner was well below average. Our meals, having ordered various sizes, turned out all to be exactly the same, which was very small, and all of the food was cold. I appreciate it’s hard to cook fast food when the park is so quiet and keep it warm, but still it wasn’t pleasant. Nevertheless we headed back round past Megafobia and into the queue for the Bobsleigh. (The longest queue of the day at about 4 minutes) Unlike a Bobsled roller coaster, this ride you control the speed yourself, with a joystick-like throttle. It’s the only attraction in the park which really uses the terrain; you ascend a very long lift hill without coming off the ground at all. As it was wet most people were being scaredy kill-joys, and as a result my fun came to end about half way down as I got stuck behind a series of other guests. Of course karma soon came back to bite me as my sister then forget which way to press the throttle and accelerated into me at the end. Then it was onto Bounce, the Huss drop tower. Technically speaking Bounce is the tallest ride in the park at about 150ft, but as it’s built in a valley it appears to be shorter than both Speed and Drenched. I’m not sure why the park chose this location, perhaps it was down to planning regulations, but I couldn’t help but feel it would be much more intimidating on higher ground, up near the Neverland area. The ride itself was enjoyable, it’s more like a Space Shot than a regular drop tower and bounces you down (I guess I should’ve picked up on that from the name) and overall it’s a very family friendly attraction. I had promised myself that I wouldn’t reduce myself to credit whoring (going on kiddie coasters just to boost the coaster count) but Treetops proved just too alluring, and it actually turned out to be rather good. It’s no weaker than any Mack mine train, and there are some dangerous near misses with trees along the way. The final coaster of the day (even I wouldn’t stoop to go on Clown Coaster) was Speed, Oakwood’s most recent major attraction, a large Gerstlauer Eurofighter. I’m not a massive fan of either of the other Eurofighters I’ve been on, Saw (Thorpe Park) and Rage (Adventure Island, Southend) mainly due to their aggressive roughness, but Speed showed no signs of this at all. The first drop was excellent; I feel like Saw doesn’t quite have the height to make the most of the drop and Speed’s dive is less jerky but without being overly drawn out. The airtime hill provides a brief moment of insane, near painful, negative g force. The loop wasn’t as forceful as I expected, I guess because the train has lost a good bit of its speed by this point, but the inline twist and helix finale is still really good fun. Still with time before Drenched’s 2pm opening we explored the new Neverland section of the park. The log flume, the main attraction in the area, is good fun and it’s encouraging to see the park investing in theming, the London area looks especially detailed; Big Ben chiming on the hour is a nice touch. Finally we got onto Drenched (Hydro was a much cooler name by the way) and for the first time I had genuine nerves in my Stomach. The ride really is Oblivion-upon-water, but instead of being dangled above the drop, here you are pretty much chucked off the end. The drop is incredible, almost as good as Oblivion, and before you’ve even hit the bottom the water in the trough of the track is squirting up around you. As you crash down a massive 50ft wave is sent up, and of course it comes down again on top of you. But worse is the water that seems to rise up from the bottom of your seat; you really do get completely drenched. The only sensible way to dry off was obviously to get back on Megafobia, so we finished our day with one more circuit of the excellent woodie.